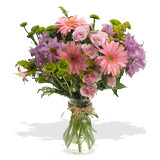 Arrangements of multi color lilies make multi meanings and a handsome decoration. Lilies have a good vase life so multi color lilies are often used as decoration on restaurant tables as their vibrant and diverse color makes a lovely table arrangement. To express certain meanings, chose certain colors of lilies and create a multi color flower bouquet with your desired meaning. To create an attention grabbing bouquet, orange and red lilies stand out stunningly. Arranging Multi Color Lilies: Cultivated for over 3000 years, Lilies are one of the oldest flowers in history. The symbol of chastity and virtue in Christianity, these versatile blooms are symbolic of summer and abundance in Feng shui, and symbolize “forever in love” to the Chinese. Your multi colored lilies will arrive in bud form, and will open in succession over the next 1-3. Your lilies will have an estimated vase life of between 7-10 days if properly taken care of. Lily pollen can stain clothing and furniture, so carefully remove the anthers (the orange pollen-coated tips at the end of the stamens) with tissues before displaying your multi colored lily bouquet. Multi Color Lilies Bouquet Care Tips: Your multi lilies bouquet has an estimated vase life of 7-10 days, if properly take care of your lilies can last longer. Your multi lily bouquet will arrive in bud form, and will open in succession over the next 1-3 days. Cut the bottom of the stems 1 inch diagonally under running water and remove all the leaves that fall below the water line. Place your lilies in the vase with lukewarm water mixed with the first packet of floral food. Your lilies are thirsty flowers, so make sure you check the water level daily and replace with fresh water and more flower food if necessary.